Steven Pratt, M.D., is a renowned authority on the role of nutrition and lifestyle in disease prevention. He is a senior staff ophthalmologist at Scripps Memorial Hospital in La Jolla, CA. Kathy Matthews has co-authored several health and medical bestsellers, including Medical Makeover and Natural Prescriptions. In their new book, SuperFoods Rx, authors Steven Pratt, M.D., and Kathy Matthews start with the simple premise that “some foods are better than others for your health.” The 14 “known nutritional powerhouse foods” on the list of SuperFoods were chosen because of their high concentrations of important nutrients. These are the “flagship” foods in a given category – foods that are of interest to scientists and nutritionists because of their potential to help protect against many diseases of aging, from heart disease to dementia to type 2 diabetes and certain types of cancer. 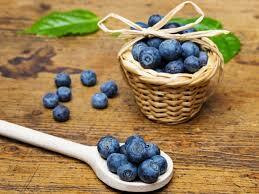 Blueberries are a “flagship” food in the fruit category. The other 13 Super Foods include: beans, soy, broccoli, spinach, oats, tea (green or black), oranges, tomatoes, pumpkin, turkey, salmon, walnuts, and yogurt. There’s still time to get your blueberries in Northwest Indiana! Please call ahead for availability. CLICK HERE FOR A COMPLETE LIST WITH WEBSITE LINKS!